Combine the flour, salt, mustard and black pepper in a bowl. Grate in the butter and mix with a fork until you have a coarse, crumb-like texture. Make a well in the center and add the olive oil and about 1 cup of ice water. Pull everything together to form a workable dough. Mine was quite soft and wet. Knead for half a minute with light fingers, and then cover with foil and leave to chill in the fridge for at least half an hour. To make the chickpeas from scratch…cover the chickpeas with water by a few inches in a pot. Bring to a boil, boil for about a minute, and then turn off the heat and let sit for an hour or more. Drain. In a large pot, warm the olive oil. Add the bay leaf and shallot, cook for about a minute, add the garlic, stir and cook for about a minute. Add the chickpeas. Stir to coat with oil and herbs, and cook for a minute or two until sizzling. Add water to cover by a few inches (I think I added about eight cups of water.) Simmer until the chickpeas are soft but not mushy…for me it was about an hour and a half. Drain, reserving the broth, and set aside. In a large frying pan over medium heat, warm the olive oil. Add the shallot, cook for a minute or two, add the garlic and herbs, stir and cook for a minute or two. Add the carrots, stir and cook until they start to seem bright and soft – five to ten minutes. Add two cups of chickpeas and one cup of broth and the tamari. Bring to a boil, reduce heat and simmer until the broth is gone, but the pan is not completely dry. Add the peas and corn and cook till they’re warmed through. Butter and flower a deep baking dish (I used a soufflé dish, but you could use an oven-proof bowl if you need to, or even a springform pan or cake pan) Break off 3/4 of the dough and roll to be about 1/4 inch thick. You don’t want it to be too thin. Line the dish, cutting off the extra around the edges, but leaving about 1/2 inch overhang all around. Spoon the filling into the dish. Roll out the last 1/4 of dough, and place it on top, folding the edges over. 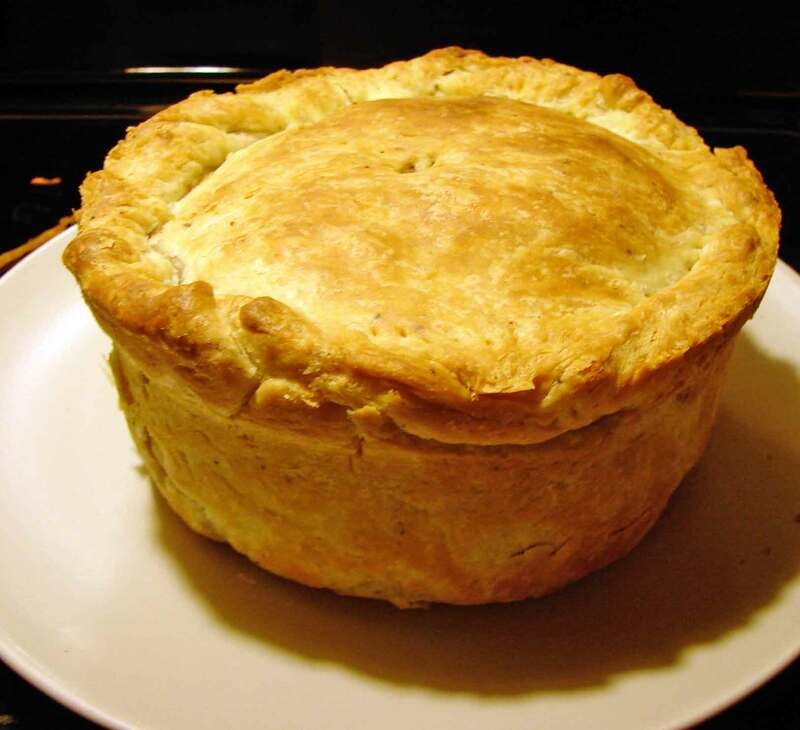 Poke a hole in the center and seal the edges with a fork. Bake for about 40 minutes, till the top is puffed and golden. Remove from the oven and let it cool for a few minutes before you loosen it from the dish and turn it out onto a plate. Melt 2 tablespoon of butter over medium heat in a large frying pan. When it starts to bubble and turn brown, spread half the sweet potatoes in the pan in an even layer. You’ll want it to be 1/2 – 1 inch thick. Sprinkle the cheese and rosemary over, and then top with the rest of the sweet potatoes in an even layer. Let it cook for about five minutes, pressing the top flat with your spatula. Try to turn it over! I loosened the bottom, and then slid it onto a plate, and then turned that upside down back in the pan. It crumbled and fell apart a bit, but that was fine. Turn over again – I broke it into two pieces, and turned one at a time. Cook the other side, pressing down, for about five minutes, till the bottom starts to brown. Try to turn it over again until both sides are nice and brown, and the center is soft and cooked through. 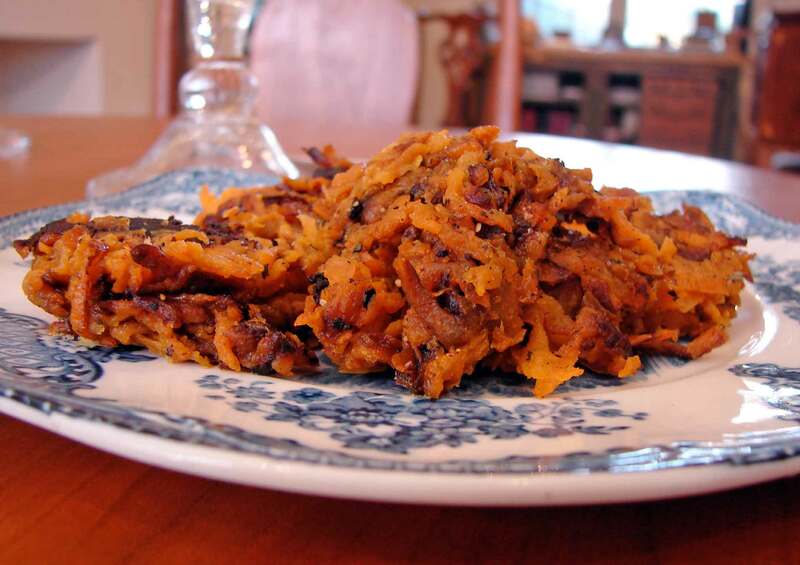 At some point it might turn into sweet potato scramble, but that’s fine, too. Transfer to a plate, season well with salt and pepper, and serve! 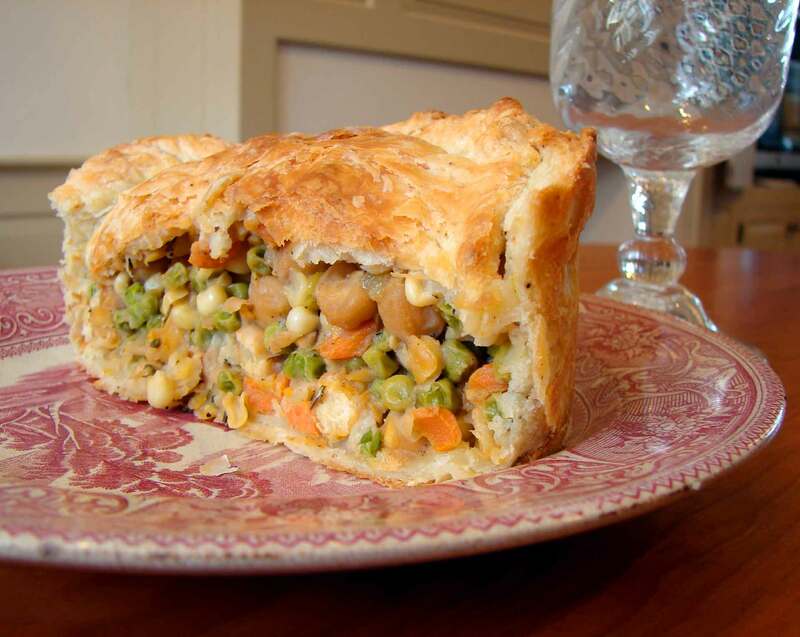 This entry was posted in basic pie filling, beans, crust, pie, potatoes, recipe, Uncategorized, vegetable side dish and tagged chickpeas from scratch, cooking dried chickpeas, sweet potato hash browns, vegan, vegan pot pie, vegetarian chicken pot pie by Claire. Bookmark the permalink. It looks great! Glad you posted also the section! yummy! I’m in awe of your pastry. “Believe me, I still have plenty of insecurities, but I know what they are, they’re my familiars, and I will not let anybody exploit them for financial gain.” – Claire, I love this line. Happy Thanksgiving my wondeful old friend. xo Lisa Mac. Thanks so much for letting me know! I’m glad it turned out well.